Carbamate insecticides are widely used in commercial agriculture and home gardening [1, 2, 3]. They act by inhibiting the enzyme acetylcholinesterase, causing an increase in acetylcholine activity at nicotinic and muscarinic receptors [1, 2, 3, 4]. However, carbamates usually induce a transient inhibition on acetylcholinesterase, unlike the permanent cholinesterase binding due to organophosphate poisoning . A serious side effect of organophosphate and carbamate intoxication is the development of acute pancreatitis [1, 2, 3, 4, 5, 6, 7, 8, 9, 10, 11]. We describe a patient who developed acute pancreatitis with subsequent pseudocyst formation after the ingestion of a carbamate insecticide, carbofuran, an agent that has never been previously reported to be associated with similar complications. A 36-year-old Caucasian woman was referred to our department due to carbamate insecticide intoxication (carbofuran 35%), after an unsuccessful suicide attempt. Her husband claimed that she had swallowed 10 mL of carbofuran two hours prior to admission. Except for this first attempt, her medical record was unremarkable. She had no history of alcohol abuse and was not on any medication. On admission, the patient’s level of consciousness was altered. Her temperature was 39 °C and the heart rate was 98 beats per minute. Clinical examination revealed pinpoint pupils. She appeared to have severe abdominal tenderness, but no rebound phenomenon. Peristalsis of the gastrointestinal tract as well as salivation were markedly increased. Complete blood count showed an elevated white blood cell count with neutrophil predominance. Erythrocyte sedimentation rate (ESR) and C-reactive protein (CRP) levels were also elevated. Glucose, aspartate aminotransferase (AST), alanine aminotransferase (ALT), gammaglutamyltranspeptidase (GGT) and creatine kinase (CK) levels were all increased, while potassium levels were decreased. In particular, amylase levels had increased twelve-fold, while pseudocholinesterase levels were markedly decreased. The rest of the biochemical parameters, including lactate dehydrogenase (LDH), were within normal limits (Table 1). On blood gas analysis the pH was 7.45 with HCO3 23 mmol/L, partial arterial pressure of oxygen (Pa(O2)) was 76 mmHg and partial arterial pressure of carbon dioxide (Pa(CO2)) was 33 mmHg. Urine microscopy was normal. There were no electrocardiographic alterations. Chest radiograph showed disappearance of both costophrenic angles. On admission, the patient was immediately treated with gastric lavage and activated charcoal, followed by atropine administration. Considering the severe abdominal distress of the patient and the high levels of serum amylase, pancreatitis was suspected. Four hours later abdominal sonography disclosed a non-homogeneous, edematous pancreas. 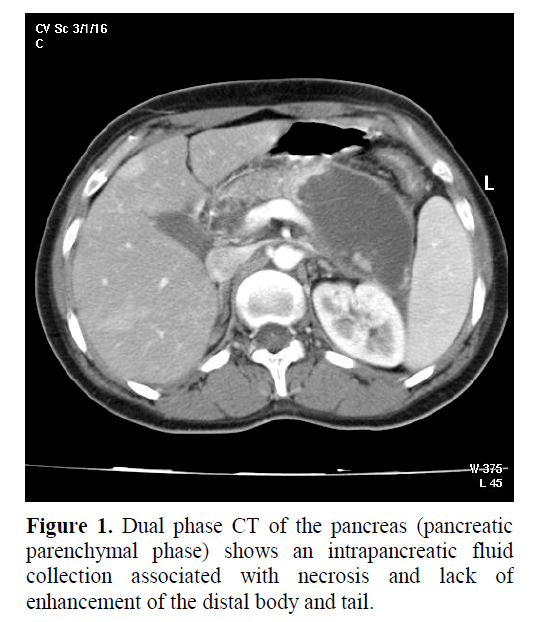 During the following day a CT scan of the abdomen demonstrated lack of pancreatic enhancement of the body and tail of the pancreas and intrapancreatic fluid collection (Figure 1). The imaging findings, along with serum amylase elevation confirmed the diagnosis of acute pancreatitis. No evidence of gallstones was found. On presentation, the Ranson criteria number was 2. The patient was treated with imipenem and total parenteral nutrition. Figure 1. Dual phase CT of the pancreas (pancreatic parenchymal phase) shows an intrapancreatic fluid collection associated with necrosis and lack of enhancement of the distal body and tail. Serial blood count over the next four days showed a fall of all cell lines, while ESR increased and CRP decreased. Serial biochemical values over the same period showed normalization of the glucose, AST, ALT, GGT, amylase, CK and potassium values, while LDH increased (Table 1). Ranson's criteria during the first 48 hours remained two. Pseudocholinesterase levels raised gradually, but were below the normal range for 7 days. Symptoms improved dramatically within the first 3 days of treatment. A CT scan of the abdomen four weeks later showed pseudocyst formation in the body and tail of the pancreas, where fluid collection was initially noticed. No other abnormalities were evident in the rest of the pancreatic tissue. Eventually, the patient was discharged in apparently good physical condition one month after admission. The incidence of acute pancreatitis in adults after organophosphate intoxication is approximately 12% . This incidence seems to be higher in children . The clinical picture is usually mild and the development of complications, such as pancreatic necrosis, is quite rare [7, 11]. However, this complication can occur not only after ingestion, but also secondary to cutaneous exposure to an organophosphate . On the other hand, painless pancreatitis is commonly underdiagnosed in patients attempting suicide with organophosphates . Cases of acute pancreatitis following organophosphate intoxication are frequently accompanied with elevation of AST, ALT, LDH, glucose and leukocyte count and decrease of potassium levels [3, 4, 6]. Some of these findings, such as the alteration of leukocyte count, glucose and potassium levels can be explained by the simultaneous occurrence of excess cholinergic stimulation and the development of acute pancreatitis [3, 4]. Pancreatic ductal hypertension, as well as stimulation of pancreatic secretion secondary to cholinergic stimulation, seems to be responsible for the development of pancreatitis [1, 2, 3, 4]. 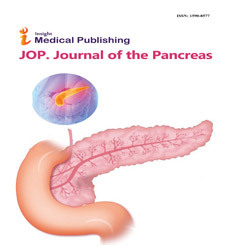 Moreover, organophosphates like echothiophate, which inhibit the two cholinesterase isoenzymes in human pancreas (acetylcholinesterase and butyrylcholinesterase), further increase the sensitivity of the pancreas to acetylcholine [1, 2]. In agreement with these experimental results are the findings from electron microscopy showing greater acinar injury with vacuole formation and depletion of zymogen granules in pancreatic tissue that was exposed both to organophosphate and acetylcholine stimulation, than those exposed to only one of these deleterious agents . Regarding carbamate intoxication, three cases of acute pancreatitis have been reported [4, 5, 9], but this is the first one following carbofuran ingestion. In one of these cases, severe acute pancreatitis with "fluid collections" had also been observed, but there had not been any prior atropine treatment that could potentially protect the pancreas . Furthermore, in this case, the existence of hypoxemia could have resulted in pancreatic inflammation due to hypoxemic insult of the pancreas . Finally, no additional information has been provided regarding the evolution of the pancreatic fluid collections over time. The development of acute pancreatitis is a serious adverse effect following carbamate insecticide intoxication. It may become detrimental in the acute phase, depending on the severity of pancreatic necrosis, but can also lead to the development of complications, such as pancreatic pseudocyst formation.